Have a good look at the pictures below and see how many animals you can correctly identify from the shape and structure of the front feet as depicted by the photos. These animals all occur in Pilanesberg. Good, let’s see how well you know the animals by looking at feet only. A plains animal that is quite common in most of the Northwest Parks. The tracks are on average 100 mm in length. The animal has a characteristic track in that the hooves of the front feet form a rather large opening in front. Another feature is the somewhat asymmetrical shape of the spoor or track as the one hoof is very often positioned slightly more forward than the other, which is also noticeable in the photo. A final feature to note is the blunt and rounded tips of the hooves (Blue Wildebeest). This animal is more active at night, although often seen during the day, especially in winter. The front track is on average about 85 mm long. 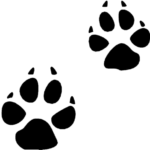 Characteristic features include the definite claw marks in the track, the trailing edge of the hind pad that is slanted, the front toes that are not aligned and the close proximity of the toes around the hind pad. The trailing edge of the hind pad has two lobes and the leading edge one lobe. Very often hair marks are noticeable around the tracks in soft sand (Brown Hyena). An animal of the plains areas with legs and feet adapted for speed. The front track is on average 92 mm long. This is an easy identifiable track because of the characteristic toe-pad or frog that is protected by a well developed hoof. These animals walk on the first digit of only the third toe, i.e. they so to speak walk on the tip of one toe, which is a feature of horses, donkeys and zebras (Burchell’s Zebra). A large (120 mm), spherical front foot with well developed dew claws (see in picture), that often show in soft sand as two depressions behind the track. The tracks are sometimes confused with that of eland, but they are larger and more rounded (Buffalo).